New Nanni engine and new gearbox fitted 2015 with 242 use. Serviced and winterised October 2018. The mast can be lowered to go under bridges. Triple Keel - Long centre keel with bilge plates. This boat is a very sturdy vessel and will be very sure footed at sea. V berth forward with plenty of stowage and the main saloon converts to a double if required. Quarter berth aft on the starboard side. New calorifier and eberspacher heating system. These sturdy, good looking motor sailors don't appear very often but enjoy a loyal following. Good performance under sail and power with the added bonus of shallow draft allows for adventurous cruising. Spacious interior with a practical layout make this boat ideal for a couple or young family. Full history and manuals available. Fuel tank 40l plastic,installed with fuel gauge. Nanni three cylinder diesel engine,shaft and propeller. Calor gas locker for two butane 4.5kg cylinders.and pipes to cooker. Webasco hot air heating . Calorifier hot water system and cold and hot water pipes to galley and toilet. Heated by engine or 240v shore power. Galley taps,pan locker.Jabsco water pump. Electric 12 v Wiring internal. Batteries 12 v matrix 80amphr feed to engine only and 120amphr feed to services. Solar panel and regulator .marlec eng ltd Corby SpectraLite 20PV panel. Shorepower 240v cable and RCD. Port saloon lockers modified to increase capacity. Horn,p&s nav lights ,rudder indicator. 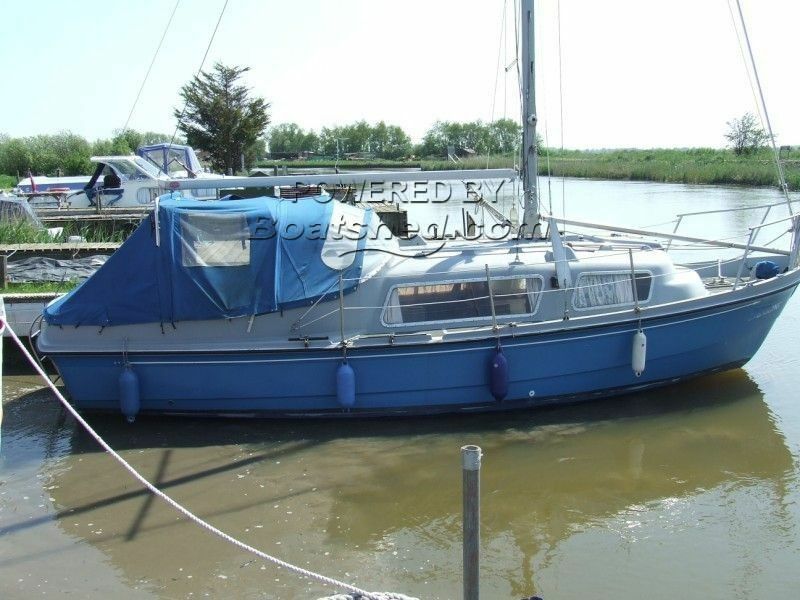 This Kent 27 G Class Kent 8 Metre has been personally photographed and viewed by Gary of Boatshed Norfolk. Click here for contact details.